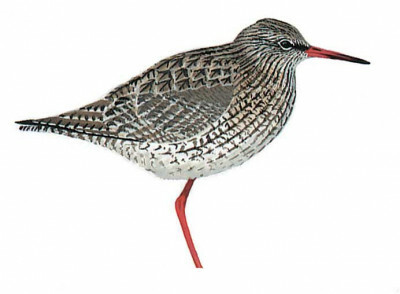 Medium-sized greyish wader with bright red legs, in flight showing white barring on tail, and broad, brilliant white trailing edge to wings. Breeding adult heavily dark-spotted, with red base of bill. Winter plumage uniform grey above, paler grey underparts with ill-defined spotted breast, mostly recalling Spotted Redshank (which see). Juvenile buff-spotted upperparts and all-dark bill somewhat recalling smaller Wood Sandpiper, but note red legs and flight pattern; larger and slimmer young Spotted Redshank has greyer upperparts, heavily barred or vermiculated underparts and fine longer bill; also different flight pattern.